The Democratic National Convention is engulfed in controversy, tension, and protest. Inside the DNC, outside the DNC gates, and throughout the city on the subway, in bars, restaurants, and hotels the political polarization is plain to see. In many ways, this DNC is the most contentious since 1968 and points to even further upheaval against the establishment in years ahead. Thousands have descended on the DNC in protest. In spite of a heat index topping 110 degrees Fahrenheit at times, there have been daily four mile marches from the city center to FDR Park outside the gates of the militarized wall surrounding the DNC. The biggest marches occurred on Sunday and Monday, involving thousands. The vast majority of people do not belong to any traditional left-wing organization. They represent a new generation of activists, awakened by Bernie’s primary campaign, and now set to move beyond him. The most popular chant, by far, has been “Hell No, DNC, we won’t vote for Hillary!” The hashtag #Demexit is trending. Green Party candidate Jill Stein has had an energetic and high profile amongst the protests. Protesters have treated her like a rock star. Undoubtedly, the vast majority of protesters, who have come from all over the US, seem set to support her. However, many will do so as a protest and still others maintain hope the Democratic Party can be reformed. Socialist Alternative has been participating in all the protests, calling for support for Jill Stein and building a completely new party of the 99%, as a necessary tool to build mass movements and a genuine political revolution. The DNC has angered many present and former Bernie supporters, not just outside, but inside the conventional hall, culminating in a walkout of hundreds of delegates on Tuesday night. Just days before the Democratic Party delegates gathered in Philadelphia, DNC emails released by Wikileaks painted a convincing picture of what most Bernie supporters had already suspected: the DNC had rigged the primary process for Hillary. Delegates faced enormous pressure to get on-board with Hillary’s campaign, even before they got to Philadelphia. Yet, many Bernie supporters have stood their ground, angered at the way the DNC has treated them. Bernie has played the chief peacemaker role for the establishment of the party, yet even he failed to bow many of his supporters who booed his support for Hillary on Monday morning in a pre-convention meeting of Bernie delegates. Since then, the DNC has gone to greater lengths to impose unity using fear of Trump, the moral authority of progressive leaders, and outright discipline action. Nina Turner, a prominent Bernie supporter and the Ohio state Democratic Party senator was stripped of her credentials, along with other Bernie supporters who have protested inside the convention hall. Things came to a head on Tuesday. The DNC had blocked attempts by Bernie delegates to democratically propose from the floor an alternative to the Vice Presidential nomination of Tim Kaine. Kaine has a record of opposing a woman’s right to choose, while support the death penalty and pro-corporate economic policies. His nomination was seen as another betrayal, and not allowing a democratic discussion and vote on his nomination was just one more example of the indefensible arrogance of the corporate leadership of the (un)Democratic National Committee. After the roll call vote on Tuesday night, hundreds walked out. The DNC’s actions created the mood for a walkout, but it was not entirely spontaneous action – no effective protest ever is, really. Keeley said that about 80 delegates walked off as Sanders conceded for the last time, but “several hundred” were prevented from leaving by police. According to one delegate, Sanders himself sent out an email telling delegates not to walk—but some committed Sanderistas have grown disenchanted with their former icon and believe that the candidate has wandered off the trail he helped blaze. A crowd of nearly 5,000 protesters gathered outside the DNC on news of the walkout. People lined up along the double barrier walls from FDR Park to the barricaded exit at At&t Station. Socialist Alternative was one of the few organizations there among one of the most energetic crowds this week. There was non-stop chanting, tensions with police, pepper spray, and arrests. The crowd later joined up with Black Lives Matter, who marched all the way from North Philly. Jill Stein, addressed the crowd to big cheers, and protesters occupied intersections and stayed long into the night. The DNC and police did not allow protesters outside and walkout delegates inside to come together on Tuesday night. The delegates staged a sit-in inside the DNC media tent, and then were dispersed and sent in different directions. Some were coaxed back inside by appeals to pay respect for the Mothers of the Movement speaking inside. Others went to City Hall for a rally with Nina Turner. But Wednesday and Thursday many walkout delegates joined the protest outside the DNC. The 1968 DNC was seen as a radical turning point for the movement against the Vietnam War. Likewise, the upheaval around the 2016 DNC, and more generally the presidential election itself, points to a historic shift to the left in U.S. society. It’s important that, in spite of Bernie’s own capitulation, many of his supporters have not gone down in defeat without a struggle. These efforts provide further evidence that the Democratic Party establishment will go to any length to frustrate, defeat, and trap any true political revolution. Now it’s time to draw clear conclusions. To win our political revolution, we can’t rely on any one individual. The “us, not me” political revolution needs our own independent mass organization to organize our revolution. We need a new party of the 99% to help capture the growing anger of millions, elect our own candidates, build grassroots mass movements, and defeat the billionaire class and their two party system. 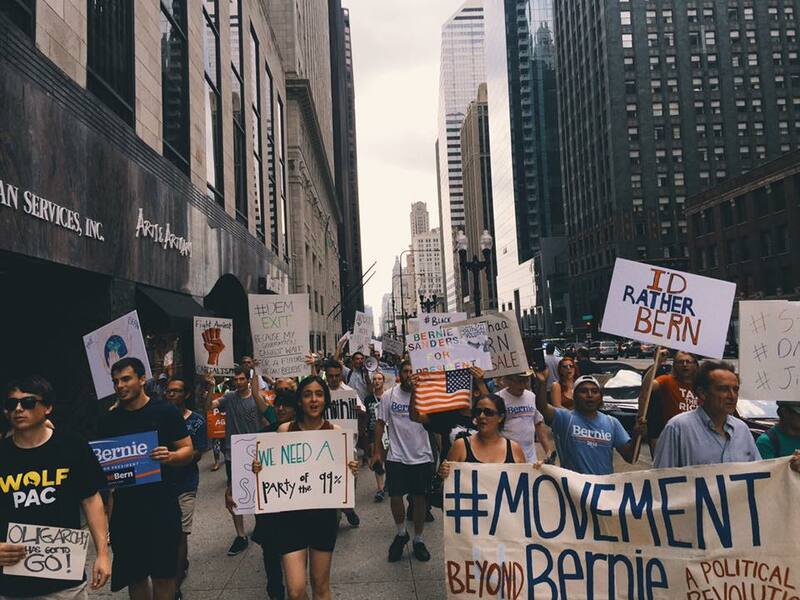 Previous articleA Call to Action: Walk Out from the Democratic National Convention!